In the upcoming local elections, in the race for the municipalities’ first people, the parties have proposed their candidates. In 55 out of 82 municipalities, the lists of candidates have the names of well-known mayors. Only in the other 27 municipalities there are new candidates. SCOOP processed the data on the assets of the candidates who will run again for mayors in these 55 municipalities. The information is reported to the State Commission for Prevention of Corruption. 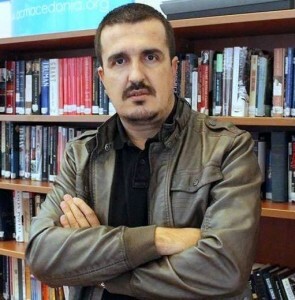 The richest mayor in the Republic of Macedonia is Ratko Dimitrovski, current and future candidate for mayor of Kocani, with nearly 4 million Euros. He is known as the owner and manager of the printing house “Europe 92” for the opening of which he received a donation from the Open Society Foundation. In addition to two houses and an agricultural land, Dimitrovski has also declared a motor vehicle Mercedes A-Class and a Smart, securities as shares and bonds to the State Commission for Prevention of Corruption. a total of 3,728,904 denars for representation. Fatmir Izairi from Zhelino is second on the list of “10 richest mayors”. His estate has 18 title deeds. Izairi owns a house, two lands under a facility, machines and other equipment and a motor vehicle. LLC-EL “FAPO PF” – Zhelino and Polyclinic “Florence” – Zhelino are also owned by Izairi. Of debts there are three loans worth about 600,000 Euros. As his spouse’s property there is one motor vehicle Peugeot 106 and PHI “Kamfora” – Pharmacy Zhelino. This municipality spent 1,183,951 denars for representation in the period from 2013 to 2016. The title deed of Enver Pajaziti, the mayor of Brvenica, is worth approximately 1,500,000 Euros. Pajaziti owns a business facility, a land, and of debt there is one loan and one lease. The holiday house at Popova Shapka and the motor vehicle Volkswagen are owned by his children. This municipality spent a total of 1,153,602 denars for representation in the period from 2013 to 2016. Nevzat Bejta, for the third time this year, will seek the citizens’ trust in the municipality of Gostivar. In the declared title deeds Bejta has an apartment and an inherited joint property. By a building contract he has acquired an apartment and business premises. He has also declared two personal motor vehicles and a foreign currency savings account worth 26 thousand Euros. In Gostivar events on 9 July 1997, Nevzat Bejta was a political prisoner. In 2013 a defamation lawsuit was filed against him by the former head of the municipality, Rufi Osmani. 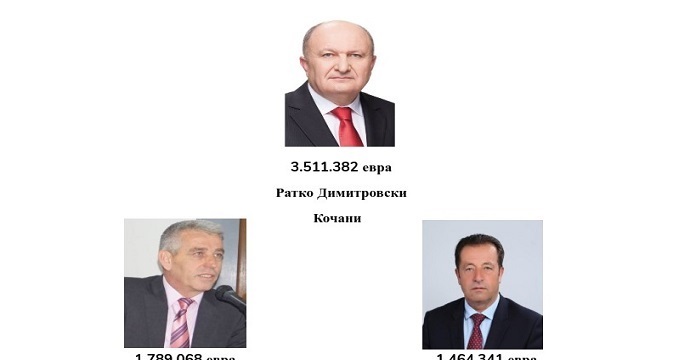 1,143,442 Euros are registered in the title deeds of the mayor of the municipality of Vevcani, Cvetomir Ugrinovski. In addition to the business premises, apartments and foreign currency deposits, the list includes a rich car fleet of 5 motor vehicles, among which one BMW 530 X drive 2017 worth 4,063,545 denars. Ugrinovski owns the company “VIA Engineering” DOO import-export, a company founded in 2000, whose priority activity is the construction of residential and non-residential buildings. Manager of the company is his son, Milan Ugrinoski. In the last two years this company has received tenders of 750,000 Euros. The municipality of Vevcani spent a total of 32,644 Euros for representation in the period from 2013 to 2016. Four title deeds without ownership data are in the title deeds of the current mayor of Demir Kapija, Trajce Dimitriev. Two houses worth 26 million denars, a share of 30 million denars and a loan of nearly 4 million denars round off his assets in the amount of 972,358 Euros. Dimitriev has his own company “Coral”. This municipality spent a total of 3,350,780 denars for representation in the period from 2013 to 2016. 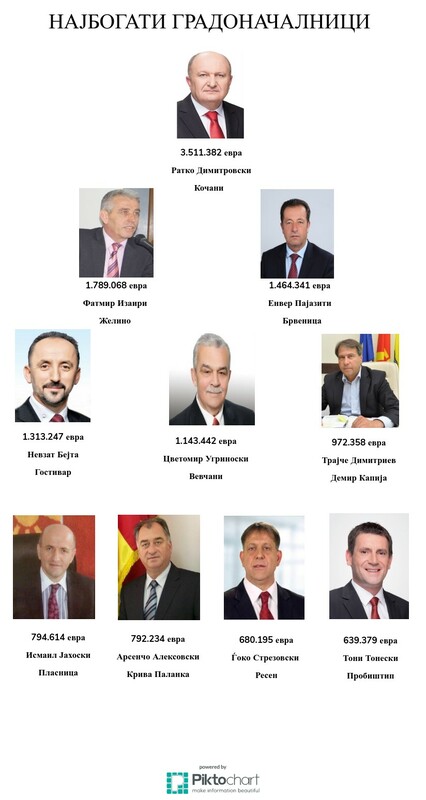 The third smallest municipality in the Republic of Macedonia, the Municipality of Plasnica, has the seventh richest mayor as its leader. Twenty-six title deeds in personal possession are in the title deeds of the mayor of the municipality of Plasnica, Ismail Jahoski. They are worth 794,614 Euros. In the previous survey for municipalities’ official vehicles and fuel consumption, it was recorded that the company owned by the Jahoski family, “Pucko Petrol”, is the holder of several tenders for fuel supply to a large number of institutions and public institutions. The mayor’s wealth cannot be compared to the situation of the municipality that has long been sinking into debt and unemployment. This municipality spent 76,000 denars for representation in the period from 2014 to 2016. The title deeds of the mayor of the municipality of Kriva Palanka, Arsencho Aleksovski, include 32 title deeds. Comprised of several houses, lands and motor vehicles, as well as a number of foreign currency savings accounts, the property amounts to 792,234 Euros. This value is far from real because it does not account for the joint venture in Multi Media Net doo Kumanovo 50%, Optical Net Skopje 1/3, as well as the entire property of “Beverly 1” Kriva Palanka for which there is no data on their value. This municipality spent a total of 2,784,914 denars for representation in the period from 2013 to 2016. Besides the house worth 12 million denars, the title deed of the Mayor of Resen, Gjoko Strezovski, has three other houses worth 11 million denars. A gun “Broving” has been declared with a gift contract. The total property of this mayor is 680,195 Euros. This municipality spent a total of 3,251,542 denars for representation in the period from 2013 to 2016. A house, a land, an apartment with a garage and auxiliary premises, two motor vehicles BMW 320 and Volkswagen Golf are only part of what is listed for the candidate of the municipality of Probistip, Toni Tonevski. He has three loans worth nearly 120 thousand Euros. This municipality spent 3,488,713 denars for representation in the period from 2013 to 2016.